This was made with the Love Struck 2010 cartridge-it has some awesome hearts on it. 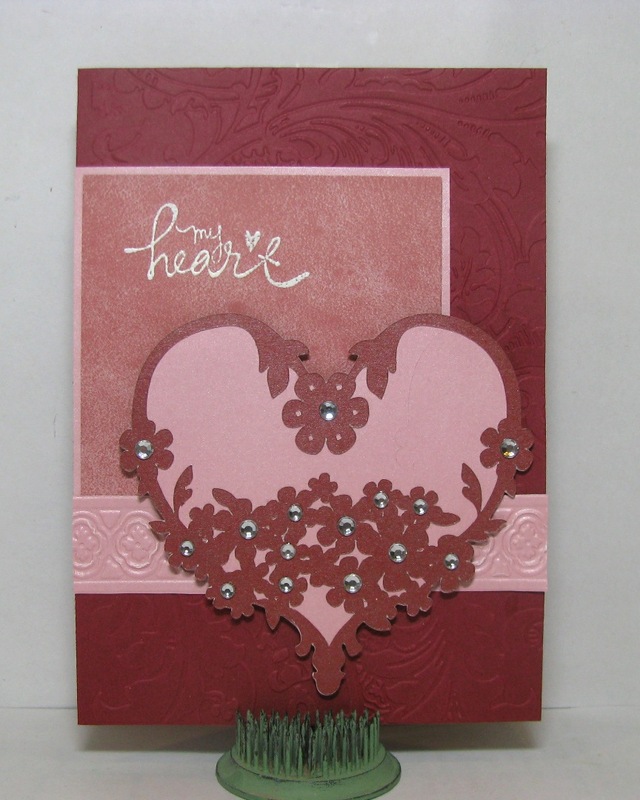 For the heart I used DCWV Shimmer red and pink paper, with Queen & Co. rhinestones on the flowers. The card is Recollection Parisian cardstock, embossed with an Anna Griffin Acanthus embossing folder. The pink shimmer paper band was embossed with the matching strip folder from the same embossing set. The stamp is from Heidi Grace (Colorbok) Wedding set, using Versamark ink with white embossing powder. Thank you for visiting, and enter the FCCB challenge for a chance at a great prize from DL.Art! Beautiful! I have this cartridge but haven't used it in ages. I think its time to pull it out and make something beautiful. Thanks for the inspiration and have a great day! !